What a tasty meal this was. 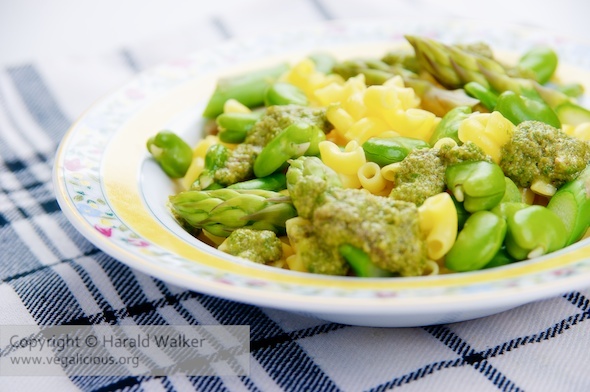 The arugula pesto was especially nice in combination with the fava beans and asparagus. Place in a bowl until later. Prepare the asparagus by cutting the tough woody end off, then slicing on the diagonal about 1 inch pieces. Cook the asparagus until al dente. Remove from the pot of water and place in a bowl. Put the peeled fava beans in the same boiling salted water and cook until al dente (when they begin to float – about 3 minutes or so). Remove from the water and place in a bowl. Meanwhile, bring a large pot of lightly salted water to boil and cook the macaroni. When the macaroni is cooked, drain off the water. Add most of the pesto and mix well. Gently add in the asparagus and fava beans. Serve the macaroni with dollops of pesto. Any macaroni is fine. We were happy to find this unusual biological corn macaroni at a health food store. Posted by Chris Walker on December 20, 2010 in Asparagus, Beans, Main Dishes, Rucola.